Evapotranspiration provides a relatively objective and reliable estimate of the water requirements of actively growing plants in a farm situation. Evapotranspiration information can be used by irrigators to more accurately schedule irrigations to help achieve top yields and improve water productivity. 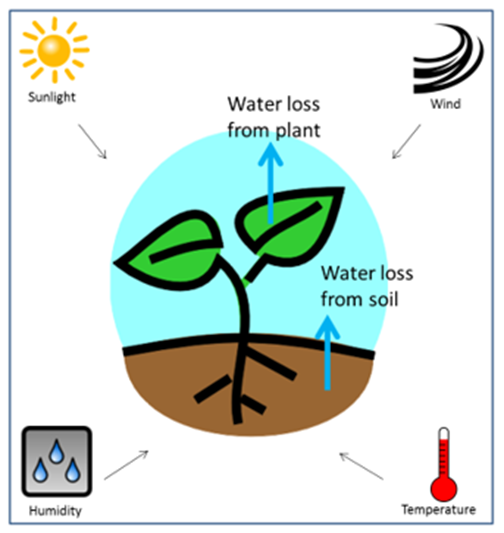 Evapotranspiration is an estimate of the loss of water from both plants and the soil. The main drivers of evapotranspiration are sunlight, wind, humidity and temperature – as shown in the above diagram. ‘Reference evapotranspiration’ (ETo) is commonly used as a standard estimate of evapotranspiration. In the context of this article, ETo specifically refers to evapotranspiration from a reference stand of actively growing, well-watered grass, 120mm in height. ETo is usually given as a daily measurement in millimetres. What are the basic principles of using ETo for irrigation scheduling? To match irrigations with high yielding plant requirements, irrigation scheduling needs to be based on both the water use of your actively growing crop and the amount of water in the soil that is readily available to the plants (also known as “Readily Available Water” or “RAW”). i) The water use of your actively growing crop can be described relative to the reference stand of healthy productive pasture. A “crop coefficient” (Kc) is used to express a crops relative water use. For example, the reference stand of pasture is given a Kc of 1.0. Where-as, the appropriate Kc for mature actively growing lucerne, maize or sorghum is likely to approximate 1.2. Your estimated crop water requirement (ETc) is obtained by multiplying the specific crop coefficient (Kc) by reference evapotranspiration (ETo). ie. ETc = ETo x Kc. ii) RAW is the component of soil moisture that can be readily extracted by plants before they suffer from moisture stress and lower growth rates. The amount of RAW in the soil is reduced as plants take up water (eg. during an irrigation cycle) and can be replenished with irrigation and rain. The maximum RAW a soil can hold will vary with the crop and soil type. For more detail about RAW and crop coefficients, refer to the Fact Sheet or Tech Note listed at the end of this article. How do I use ETo to schedule irrigations for my pasture and crops? Surface irrigation: To maintain soil moisture for optimum growth rates and yields, surface irrigations need to be timed when plant water uptake has drawn RAW down to a value equal or close to zero. 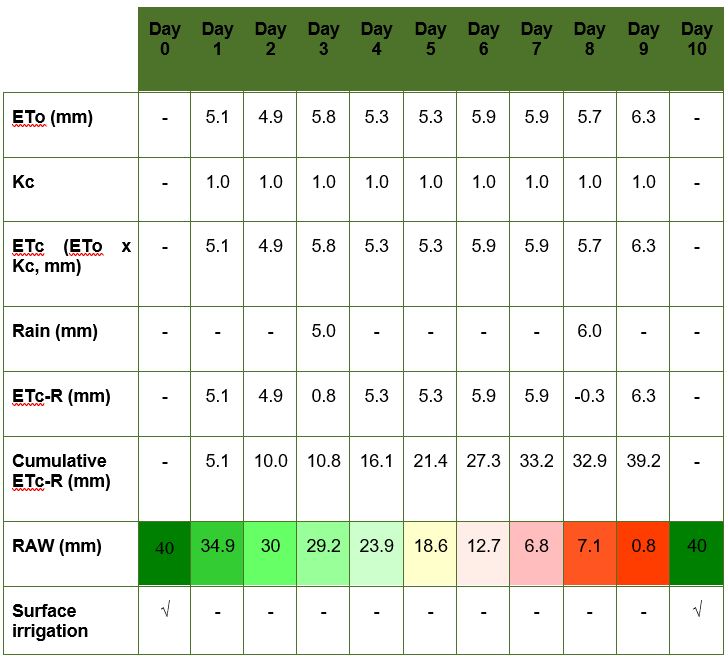 Table 1 below, shows how daily ETo and rainfall (R) figures are used to estimate daily pasture RAW to determine the timing of the next surface irrigation. In this case, it is estimated the soil can hold up to 40mm of pasture RAW. 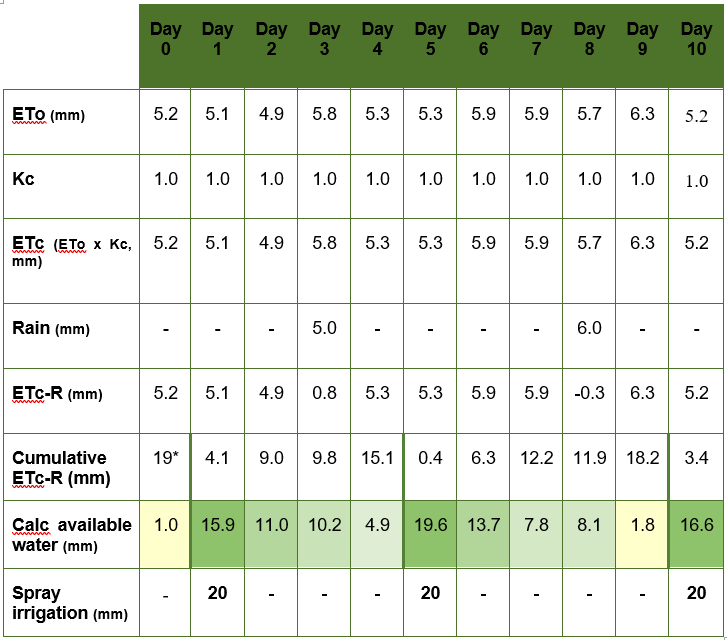 So, the next irrigation is timed when ‘Cumulative ETc-R’ equals about 40mm, when RAW is depleted or close to “zero.” It is also assumed the soil is no longer saturated following irrigation by the end of “Day 1” and normal crop water use resumes at this point. Table 1. Daily evapotranspiration (ETo) and rainfall (R) data is used to estimate pasture water use (“ETc”), pasture Readily Available Water (RAW) and optimal timing for the next surface irrigation. Spray irrigation: To optimise water productivity, the timing of spray irrigation applications are determined using a similar process described above for surface irrigation. The following sentence shows how the available water balance is calculated. On Day 1; 20mm of irrigation water is applied, minus 5.1mm ‘ETc-R’, plus 1mm remaining available water, equals 15.9mm calculated available water. Table 2. Daily evapotranspiration (ETo) and rainfall (R) data is used to estimate pasture water use (“ETc”), calculated available water and optimal timing for the next spray irrigation. * Cumulative ETc-R since the previous irrigation. ETo data can be accessed free of charge from a number of sources including the Bureau of Meteorology and SILO. The Weekly Irrigation Requirements Summaries provided on this ExtensionAUS website, and apps like irriSAT, provide an interpretation of ETo data for irrigation scheduling purposes and take the hassle out of doing calculations involved with using ETo. Like any other irrigation scheduling method, ETo should not be used in isolation. ETo needs to be used as part of an irrigation scheduling “toolkit” and ideally in conjunction with other preferred scheduling methods already used on farm.